In case you haven't guessed by now, I love the Workshop on the Go kits! With them, I feel like I get a lot of bang for my buck. You can create six cards and a layout and STILL have half a paper pack to be creative with! Note: I do add a few sheets of White Daisy or Colonial White cardstock to make all the projects. Plus, you get a stamp set to use for your creations! and the Fanfare kit--love the ice cream cone stamp! I can see using the ice cream stamp and cupcake stamp for lots of future projects! 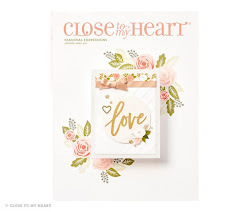 To get your own Workshop on the Go kit, which includes paper, embellishments, a stamp set, and full color instructions, click here.